Exceed is the PC X11 window market leader that empowers companies with high performance access to X applications from Microsoft Windows platforms. As the highest performing PC X server on the market, Exceed allows business users to access to UNIX and Linux-based X Window applications from the comfort of their Windows desktop. For over 20 years, Exceed has been offering organizations options to reduce the complexity of their IT infrastructures. Gone are the days when Windows and expensive UNIX workstations had to share valuable office resources, Exceed cost-effectively replaces UNIX workstations. It improves user productivity through better data exchange among applications on different platforms,and streamlines business workflow. Exceed PowerSuite is a complete connectivity solution that provides users with everything they need to access applications and data on remote hosts. It includes an OpenGL enabled PC X server, a terminal emulator, NFS client and server, and an FTP client in one convenient package. Enterprises depend on a wide variety of host systems to support their business operations: UNIX and Linux hosts for their X window CAD/CAM applications, mainframe and AS/400 for their call centers or payroll systems, and hosts with FTP and NFS services to handle their file transfer needs. They want a single solution from one vendor that can address them all. Exceed PowerSuite offers enterprise users everything they need to connect to any type of host systems in their organization and access data and applications in the most convenient ways. It combines some of the best Open Text Connectivity solutions in a single software package. Reduce the cost of software design and shorten the development cycle with Exceed XDK, an X Window system development toolkit for Exceed and Exceed PowerSuite. Enterprise-class applications take years to create and perfect, and hundreds of thousands or even millions of dollars are invested in developing those applications. As Microsoft Windows platforms continue to provide attractive cost-to-power benefits, software developers are enticed to offer their applications on those platforms. The trick is to do so quickly while leveraging the existing R&D investments, and maintaining the reliability and dependability of the applications. Exceed XDK, an add-on to Exceed and Exceed PowerSuite, is designed to allow developers to port existing X applications from UNIX or Linux systems to Windows platforms with minimum re-programming requirements. Enterprises enjoy the benefits of a great reduction in software development costs and shortened development cycles. It allows them to capitalize on market opportunities by quickly releasing software that is based on existing source code. Exceed Freedom empowers Exceed users with high-performance access to remote X11 applications over the Internet. It is an add-on product to Exceed and Exceed PowerSuite. For many years, organizations have been using Exceed, the industry leading PC X server, to fulfill their needs for X window application access. Exceed Freedom leverage time and resources spent customizing Exceed to provide the exact user experience. The world is changing. Users are more mobile than ever. They need a solution to allow them access to UNIX applications from remote locations using tools that are familiar. Exceed Freedom is an add-on solution designed to empower Exceed users with all the benefits of mobility while leveraging existing configuration and customization. With a simple click of a button, Exceed Freedom speeds up the performance of X applications by reducing X11 network traffic by up to 100 times, so they become efficient over any network connection. To further strengthen the mobility potential for Exceed users, Exceed Freedom decouples users from physical machines, allowing them to suspend an active Exceed session and resume it from anywhere. The seamless integration with Exceed translates to lower deployment, training, and ongoing support costs. Exceed Freedom helps organizations by reducing user downtime and improving user productivity. Reducing network resource consumption, in effect, expands the existing network capacity to support more users and connections. From a cost-benefit perspective, Exceed Freedom leverages existing investments in business and IT infrastructure without changing line-of-business applications or critical processes. Along with an outstanding reputation for excellence and industry-recognized customer support and services, organizations can continue to reap the rewards of their investment in Exceed. Exceed 3D empowers users with the experience of high-end OpenGL-based X applications, such as CAD/CAM design, manufacturing, medical, or seismic analysis applications, from Windows desktops. It is an add-on solution to Exceed. In the world of CAD/CAM engineering, manufacturing, geological exploration and advanced science, purpose-built applications use OpenGL-API delivering 3D visualization to users. Proper support for the OpenGL-API on an X server solution means those applications are rendered and displayed for users with the best possible accuracy and performance. With Exceed 3D, a companion add-on solution to Exceed, engineers and designers can now access those complex 3D applications on Microsoft Windows desktops. By leveraging the accerlerated capabilities of modern graphics cards, Exceed 3D helps organizations reduce operational costs by displacing expensive, high-end UNIX workstations with cost-effect Windows PCs. Exceed – 72% Market Share Worldwide outselling all competing PC X Servers combined! The Exceed Family builds on this tradition by extending the power of Exceed to Windows-based and remote users. Backed with the richest feature set, the Exceed Family delivers reduced cost of ownership and increased productivity. The Exceed family includes innovative features that accelerate performance, simplify system administration, optimize users' personal computing environments, and deliver ease of use. Exceed® - permits applications, normally available only on expensive UNIX workstations, to be readily accessed from enterprise desktops. Exceed 3D™ - adds the support of OpenGL to Exceed® and Exceed PowerSuite™, allowing users to experience the high-end OpenGL-based X window applications on Windows desktops. Exceed PowerSuite™ - combines Exceed® with Exceed 3D™ and NFS Maestro Solo™, to deliver seamless access from Windows desktops to various computing platforms in an enterprise. 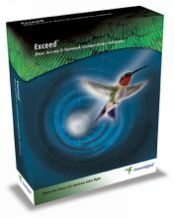 Exceed XDK™ - an X Window System development solution for designing and porting X Window applications to PCs, is an add-on to Hummingbird Exceed® and Exceed PowerSuite™. Exceed onDemand® - a member of the award-winning Exceed® family, is a remote X application access solution designed for Microsoft Windows and Linux desktop users. It cost-effectively delivers X application access to remote users worldwide.